It’s not uncommon these days for businesses to have their workers user mobile devices, mostly Android tablets or iPads, but these aren’t always customized, let alone protected, for work. That is why we have things like Android for Work, Samsung KNOX, and BlackBerry’s Android enterprise apps to ensure security. Controlling those devices, however, is another story. 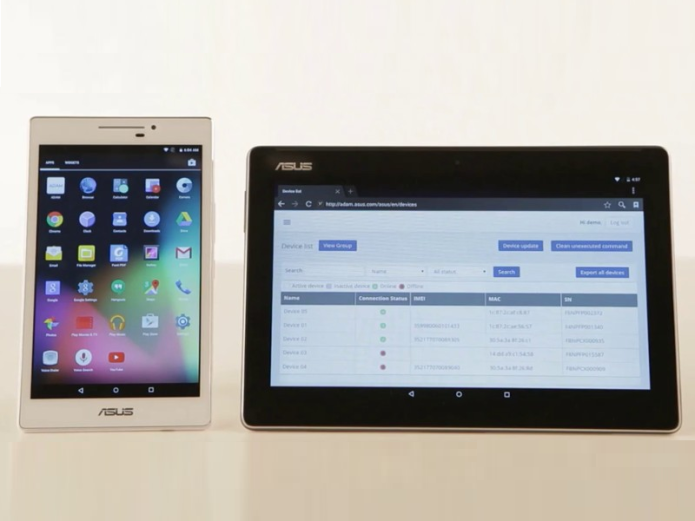 ASUS is giving its own spin on Android for the enterprise, debuting the new ZenPad M tablets for professionals. The real highlight, however, aren’t the tablets but the ADAM software. ADAM stands for ASUS Device Admin for Mobile and from that you can pretty much guess what it does. It is, in essence, a tool for the company’s system administrators to remotely control and manage other ZenPad M tablets connected to the company’s network and used for, well, official business. ADAM offers a variety of features, ranging from remotely installing or updating apps, locking down tablets to a specific app, or the usual remote wiping of stolen or lost devices. It is interesting how ADAM can also be used to remotely take a screenshot of devices, primarily to check a before and after state of the device when pushing an update. ADAM can also send messages to devices remotely, warning users about upcoming updates. Those features might just be open to other uses as well. To be fair, the features that make up ADAM have been available in Android for a while already. ASUS just bundled them app into an easy to use admin tool. All of these are done on a ZenPad M tablet itself but, amusing, not through an Android app but through a web browser. Full details of those features have already been revealed in ASUS’ promotional video. ASUS is quite focused on ADAM itself that it practically sheds no light on the tablets at all. The 7-inch ZenPad M does bear some resemblance to existing models, but the 10-inch one is quite new, though, in design, it seems to take after the latest ZenPad S. No word yet on when ASUS plans to offer it for businesses, but if there ever was a time to show it off, it would be at MWC 2016 next week.